Noel is a personal trainer who decided to take his brand to the next level by working with us to create a website. 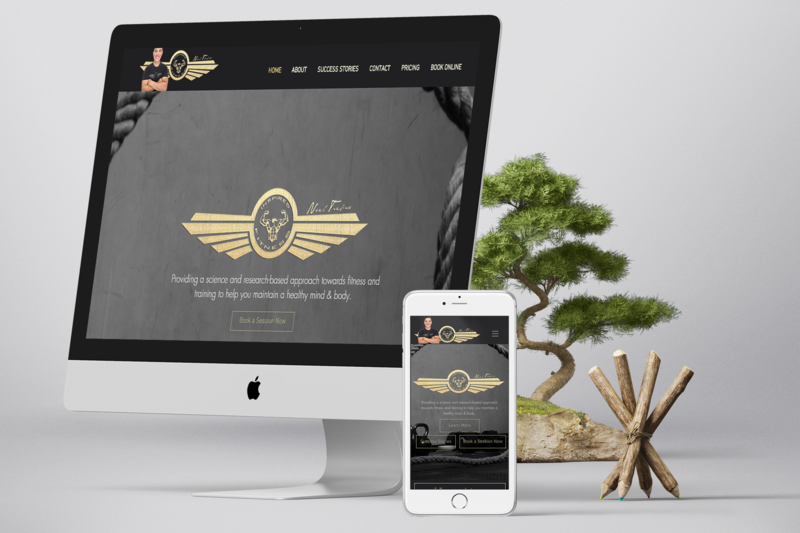 We had no inital guidance or restrictions for this web design project, so we put our heads together to invent a new branding style that was specific to how he approaches fitness with his clients and also spoke to the quality of his services. His original logo was plain black and as our branding style evolved for him, we eventually settled on a new logo design that had touches of gold which would help speak more to his quality of services. For the branding colors, we wanted to keep it simple and clean (just like his dieting style!) and opted for blacks, greys and off-whites. The end result was a website design that Noel could send his clients to that would help them learn about his other clients’ results, his pricing, and allow his clients to contact him when they needed to. Who knew a personal trainer could be a little luxe? We love it! The hard thing that Noel found as he started working with us is that, the busier he got, the less time he had to speak with new clients and pass along important information when he would meet potential clients at events or social gatherings. The solution was to provide square flyers that gave both his contact information and some pricing for his group sessions so that he could give something tangible to prospective clients while also appearing professional… especially when he may not have had the time to have a full conversation with them. As we worked with him on this design, we also consulted with him on his pricing strategy and assisted him in developing pricing plans that would appeal to his target market. The end results came out beautifully, as we ensured that we ordered quality and luxe prints that continued the quality of design and service. Noel knows that he wants quality in every item that is branded with his logo and name and his cards were no different. His business card design was completely in line with the branding we’ve achieved on his website and the outcome couldn’t have been better. For designs like this and for those who really seek quality, we’ve partnered with Moo to order luxe soft-touch cards that would complement his style of design perfectly. One of the things that he noticed was that people who received a nice quality card were less likely to throw them away and more likely to comment about how nice they were and take him and his business more seriously. We were pleased to create these cards for him and have enjoyed watching his personal training clientele grow rapidly! One of the things that Noel mentioned to us during some of our client meetings was that he wanted to appear more professional and give his clients the professionalism and quality that they deserved. At the time, he was providing his clients with Excel sheets and copy and paste e-mails that didn’t have his branding nor the professionalism that he really wanted to see. 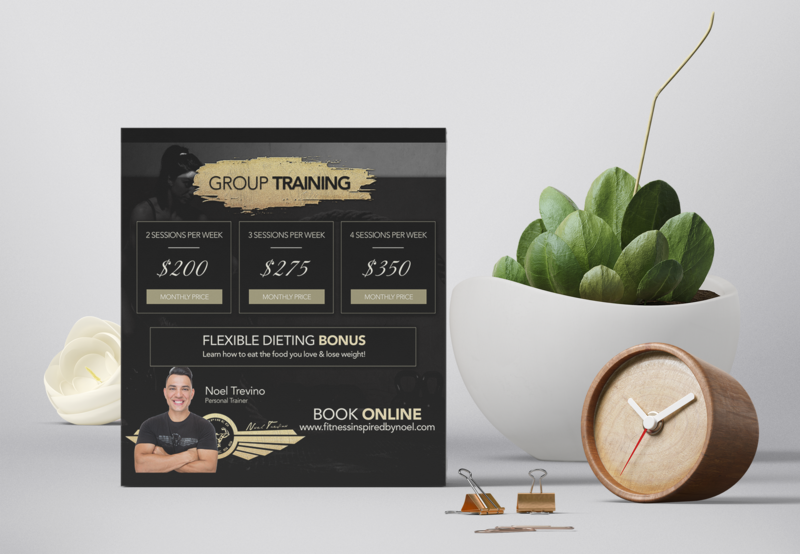 After Noel worked with us to create his website, cards and flyers, he also requested a new document that was printable and PDF editable that would allow him to customize different diet and workout plans for each client. 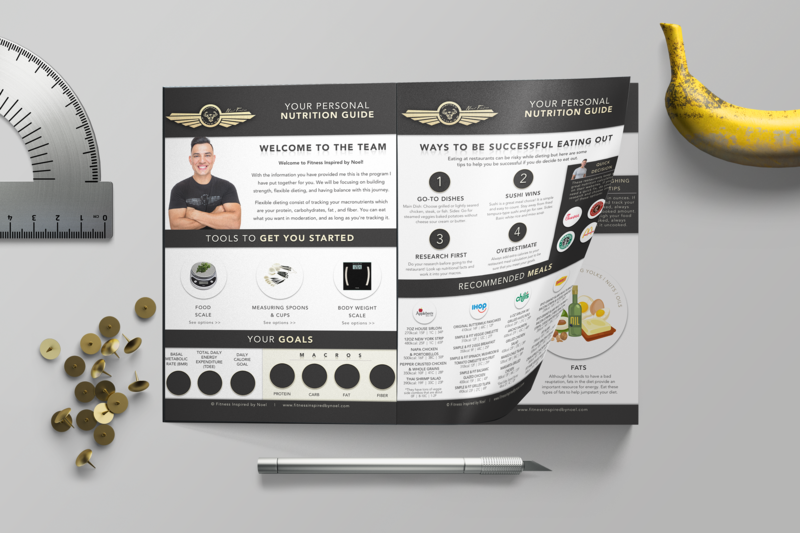 We created a PDF editable document that he can easily update and e-mail to his clients that has his luxe-style branding and his tips and tricks that help his clients feel like he is coaching them when they’re not even at the gym. This was quite an enjoyable project and we enjoyed setting a new bar for personal trainers in terms of branding and client expectations!